Running out of storage space? 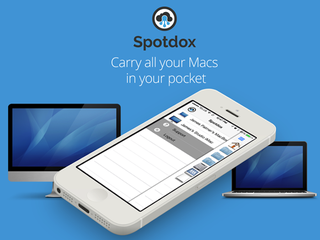 Spotdox is a great companion app for Dropbox users. A Dropbox add-on, Spotdox gives you secure, remote access to any file on your Mac, not just your Dropbox folder. It's pretty cool, and for a little while, Lifehacker readers can get 66% off Spotdox - just $19.99 for lifetime access. Spotdox is really easy to use - barely any setup required. Still in doubt? Thorin Klosowski at Lifehacker said Spotdox is, "a dead simple way to make your computer easy to access from anywhere without really setting anything up." The one catch of Spotdox is this: though you can access any file on your Mac from anywhere, that Mac must be on. As opposed to Dropbox which stores your files in the cloud, Spotdox gives you a cloud access point to any file on your hard drive. But, because Spotdox goes through Dropbox to access your computer, a Spotdox connection is entirely secure. Spotdox is great for anyone who travels, studies, or works across several devices (which these days, is all of us). Spotdox can prevent that situation where you don't have access to a crucial file. This deal is good for 1 lifetime license of Spotdox. Spotdox is connected to your Dropbox account, so it will work across however many devices you've connected your Dropbox to. Spotdox is fully compatible with mobile. Normally $56, for a limited time Lifehacker readers can grab it for $19, or 66% off. StackSocial curates exclusive deals on trending and innovative digital products. They've partnered with the commerce team to bring you these specials. So to be clear, this post is not editorial and we make money on sales.